Now, that may seem like a lot, but if you counted up all the steps you take during an average day, it might be more than you realize. For example, how many steps do you take while shopping, while at work, running errands, or, just working around the house? This brings us to a discussion of pedometers, those little devices you wear on your belt to count steps and measure distance walked. But, are pedometers just another passing fad in the fitness industry? • Between 1999 and 2007, the Walk4Life company has sold more than 1.5 million units of its brand of pedometers. • In May 2004, McDonald's announced it would distribute 10-15 million step counters as part of its "Go Active! Happy Meal" plan. • In 1999, in an effort to get people walking, the non-profit Minnesota health care organization HealthPartners initiated an 8-month "10,000 Steps" program. Participants were given a pedometer and some printed information. The program was very well-received. Nearly all participants doubled their daily step counts, a vast majority felt like they increased their physical activity, and many claimed they lost weight on the program. • A review of published studies in the November 21, 2007 issue of JAMA revealed that pedometers increased walking by an average of 2491 steps per day, and, increased physical activity by 26.9% over baseline (Bravata DM, et al. 2007). • Researchers from Australia and New Zealand published a study in the May 2012 issue of Annals of Family Medicine showing that, at 3 months and 12 months after receiving a pedometer, subjects increased the time spent walking (Kolt GS, et al. 2012). • Lower blood pressure: In the study from Australia and New Zealand mentioned above, at 3 months and 12 months, a significant drop in blood pressure was seen (Kolt GS, et al. 2012). • Weight loss: A meta-analysis of 9 studies assessing the impact of pedometers on walking and weight loss revealed that the amount of weight loss averaged 1.42 kg (= 3.1 lbs) after subjects were given pedometers. The amount of weight lost was statistically significant in 5 of these 9 studies (Richardson CR, et al. 2008). The JAMA review mentioned above also shows that pedometer use was associated with weight loss and a lower blood pressure (Bravata DM, et al. 2007). Thus, it appears that pedometers may be around for some time to come. Although the invention of the pedometer has been attributed to US president Thomas Jefferson, apparently Leonardo da Vinci conceptualized a similar device in drawings from the 15th century. In the US, pedometers became popular in the 1930s as a result of the radio program "Jack Armstrong: All-American Boy" and his Hike-o-Meter pedometer, and again in the 1960s when the Japanese walking program known as "manpo-kei" was popularized. In Japanese, "manpo" means 10,000 steps. Yamasa produced a pedometer they called "manpo-kei", or, literally, "10,000-steps meter" (Sidman CL. 2002). The first distinction to make is the difference between a pedometer and a step-counter. A step counter simply tracks the number of steps taken. A pedometer counts steps too, but, in addition, determines distance walked. Most people use the term "pedometer" to refer to either type, and that's what we'll do, too. Next, we need to differentiate pedometers from accelerometers. Pedometers work by detecting vertical (up-and-down) motion. Pedometers count a step each time they detect this vertical change in direction. A spring-suspended horizontal arm bounces up and down inside the unit. It takes about one-third the force of gravity to deflect the arm enough to register a click. Accelerometers are more sophisticated: they are small computers that measure acceleration of movement in up to 3 dimensions (eg., up/down, right/left, and forward/backward). Accelerometers are very expensive and require expertise to use. Pedometers are typically worn at the waist, while accelerometers can be worn on the foot or ankle. Pedometers should not be worn at ankle level, however. In this position, the pedometer receives too much shock during each stride causing it to register an excessive number of steps (Cyarto EV, et al. 2004). There are a wide variety of pedometers on the market. The most basic models sell for around $10 and do nothing more than count steps (ie., step-counters). Other models display speed, elapsed time, calories burned, steps per minute, pulse-rate. Some include a stop-watch, alarm, 7-day history and more. • Ability to Up-Load Data: Some brands allow you to connect your pedometer to your computer. You can then upload your daily data and generate a variety of charts and graphs. This helps you to track your progress. • On-Demand Voice Read-Outs: Some models, such as the SportLine 343 Talking Pedometer, have this feature. • Variable Music Tempo: The SportLine 343 Talking Pedometer will increase or decrease the tempo of the music to match your walking pace. Like many products on the market, you get what you pay for. In general, pedometers are most accurate in counting steps, less accurate in calculating distance, and very poor at estimating energy expenditure (Crouter SE, et al. 2003) (Schneider PL, et al. 2003). Nevertheless, with regard to counting steps, some relatively-inexpensive pedometers perform extremely well. Research over the last 10 years has documented a very high accuracy rate for pedometers made by Yamax (Bassett DR, et al. 1996) (Schneider PL, et al. 2003). Yamax is a Japanese company. Japanese manufacturing standards specify an error rate for pedometers no higher than 3% (Crouter SE, et al. 2003). No such standard currently exists for pedometers made in the US. Several studies show that very slow walking (54 meters/minute) can impair the performance of pedometers substantially. In one study of nursing home residents, even the very accurate Yamax DigiWalker SW-200 pedometer underestimated step count by 74% during slower walking (Cyarto EV, et al. 2004). The "shuffling gait" (see below) in these subjects also contributed to the low accuracy. In another study, pedometers underestimated actual step count by 20-33% (depending on the wearing position) at a walking speed of 54 meters/minute (Swartz AM, et al. 2003). But, at more typical walking speeds between 67 and 107 meters/minute (the textbook value for walking speed by healthy adults is 84 meters/minute), the Yamax SW-200 has been shown to be highly accurate (LeMasurier GC, et al. 2003). Pedometers depend on a slight "bump" or "jolt" to register a step. Thus, pedometers are less accurate in people who "shuffle" their feet, such as elderly nursing home residents who lean on a walker (Cyarto EV, et al. 2004). The accuracy of 2 pedometers was evaluated in children, ages 5-11 yrs, while they walked around a track ("self-paced walking") and on a treadmill. Two additional brands were also tested on the treadmill. The Yamax Digi-Walker SW-200 and SW-701, and the Walk4Life 2505 all performed well and their measurements were in high agreement. The SunTrek LINQ performed noticeably worse at speeds of 67 meters/minute and slower (Beets MW, et al. 2005). Pedometers are really pretty primitive devices. They simply tabulate a step when the lever arm inside is jolted up or down. They have no way of adjusting for factors that can greatly affect calories used, such as, the difference between walking on a level road vs. walking on a hilly trail. Obviously, uphill walking burns more calories than walking on a level surface. When purchasing a pedometer, make sure it's held securely in place. Some models clip on a belt and some are hung around the neck. The pedometer should remain in a vertical position during use. 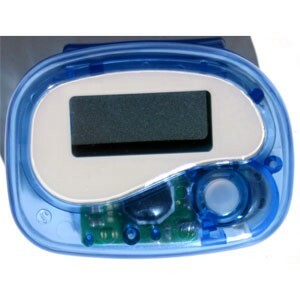 Purchase a pedometer with a protective cover. This helps to prevent accidentally resetting the count. The display should be easy to read without having to take the step counter off your belt. You should first calibrate the device for your average stride. Adjust your pedometer by walking or jogging a measured distance, with the stride setting in the middle; the standard setting is 2.2 ft. for women and 2.5 ft. for men. Then adjust this setting up or down. Cover the same distance again in the same mode, and fine tune the setting until you are recording accurately the distance covered. Put on pedometer and find a space where you can walk at your typical walking pace. Reset your pedometer so it reads "0" and carefully close pedometer cover. Carefully open pedometer (rough handling can cause erroneous steps). Note that different pedometers have different sensitivity thresholds. Some pedometers allow you to adjust the sensitivity threshold. Examples of pedometers that have this feature are the Omron HJ-105 and the Oregon Scientific PE316CA, however, both of these models performed poorly in recent evaluations of step-counting accuracy (Crouter SE, et al. 2003) (Schneider PL, et al. 2003). Q: What is the best placement for a pedometer? ANSWER: In one study, the accuracy of electronic pedometers was no different if worn at waist level on (a) the anterior mid-line of the thigh (aka: "front", manufacturer-recommended placement), (b) the mid-axillary line (aka: "side"), or (c) the posterior mid-line of the thigh (aka: "back") (Swartz AM, et al. 2003). Q: Are pedometers less accurate when used by obese persons? ANSWER: It appears that pedometers work as well on obese subjects as they do on normal weight subjects (Swartz AM, et al. 2003)...as long as the pedometer remains in a vertical position. If the person's abdomen is large and causes the pedometer to tilt forward when wearing it on the front of the waistline, then it should be moved to the side (hip). Q: Does the road surface affect the accuracy of pedometers? ANSWER: No differences were seen when walking on a sidewalk was compared to walking on a rubberized outdoor track (Bassett DR, et al. 1996). However, users should also note that pedometers can't make any distinction between level walking and walking on an incline. In other words, while step-counting might be accurately recorded while walking inclines or hills, calories burned may be way off. Q: Do pedometers lose accuracy if you use them a lot? ANSWER: In one study, the pre-use error rate of one model was 1%. After 7 weeks of heavy use in a research setting, the error rate was 3% (Sidman CL, et al. 2001). • Features: Decide if you only want a pedometer that counts steps, or, if some of the other features described here are also important. You can spend anywhere from $9 to over $200 for a pedometer. • Accuracy: Prior to each use, check the pedometer's accuracy by counting off 20-50 paces and seeing if the unit registers the correct number. Also, make sure your waistband isn't so loose that the pedometer bounces around; this will reduce accuracy. But don't get too hung-up on which model of pedometer is most accurate. If a pedometer gets you exercising on a more regular basis, then it is doing its job. • Walking vs. Running: If you want to use your pedometer during both walking and running, find one that allows you to adjust the sensitivity setting. • Obtain medical clearance: Men over age 40 and women over age 50 should obtain medical clearance from their physician before beginning a new exercise routine. An excellent web site for general information on pedometers and reviews of specific models is www.Pedometers.com. The web site www.New-Lifestyles.com not only sells quality pedometers, but, also educational kits for establishing an exercise program at the grade school level, a kit targeted to diabetics, and other exercise and activity-tracking materials. This site can also be accessed from: www.ThePedometerCompany.com. The Walk 4 Life group (www.Walk4Life.com) has a superb web site. They have been promoting the use of pedometers to increase activity levels since 1999. The Surgeon General's Report on Physical Activity and Health is located at: www.CDC.gov. The President's Council on Physical Fitness and Sports www.fitness.gov. DISCLOSURE: Neither the author, nor AthleteInMe, LLC, has any financial relationships with any of the products or companies mentioned in this review.